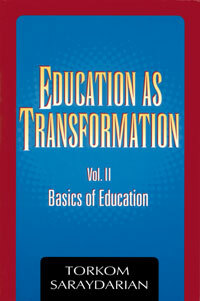 Education as Transformation, Volume 2 provides the basics of education. It defines what should be the vision and direction of education in the new millennium. If knowledge does not have such a vision it destroys itself. Many an ancient civilization disappeared because it used education to suppress and force people into a culture of fear and separativeness. "When critical times come, people, groups, nations, and humanity search for new education because they face life and find that the education they received previously cannot solve their present problems. This is a very important thought. When you suddenly feel that you are inadequate or powerless to solve the problems of your family and your life in general, in order to make a breakthrough you desire to have a new education or a new tool in you hand to solve your problems.